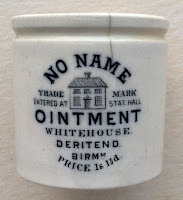 This page shows the various "No Name" pots originating from the Birmingham area. 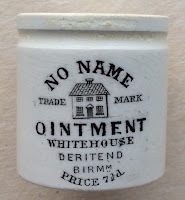 Early references to 'Whitehouse' in 1867, referred to a John Whitehouse based at High Street, Deritend, a suburb of Birmingham. 25 years later, the directories listed an E.B. 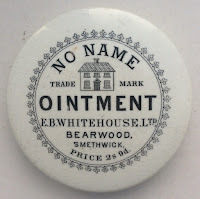 Whitehouse (Edward Benjamin) bearing an address as Bearwood, Smethwick. 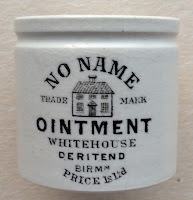 Two size pots exist bearing the name Whitehouse, Deritend, with prices listed at 7½d (small size) and 1s 1½d (large size). 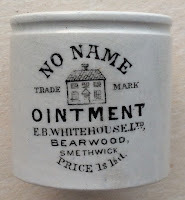 Pots also exist with the same prices bearing the name 'Whitehouse Bearwood Smethwick' and 'E.B. Whitehouse'. 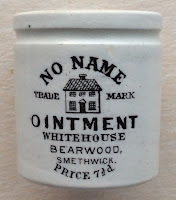 There are a super pot lids, large in size showing a price of 2s 9d, and depicting the usual 'house' trade mark pictorial, one in the name E.B. 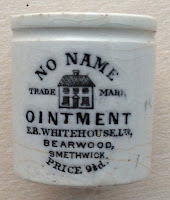 Whitehouse Ltd with the Bearwood Smethwick address and another with just Whitehouse, Bearwood, Smethwick. 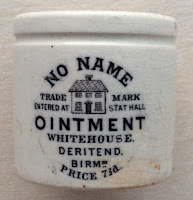 I have recently discovered a large size Whithouse Deritend pot with the words 'Entered at / Stat. 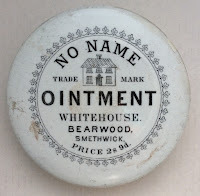 Hall' implying that the 'No Name' product was exhibited at the Great Exhibition in 1877. Furthermore, another variation I have found is a small size E.B. 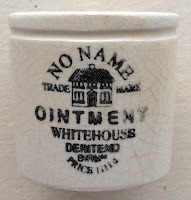 Whitehouse Ltd pot with a price change to 1s 3d. 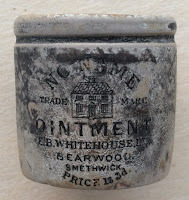 Sadly this pot is in poor condition having been badly burned and the glaze destroyed. 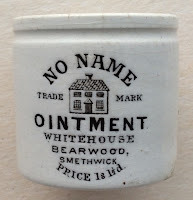 Until another surfaces, it is a valued pot in the collection. book produced by Messrs. Houghton & Priestley, page 107.